It wasn't long after we brought our first Alpacas home that we saw a sight, similar to this picture - well, maybe not so many in one shot. Out of the house we would run to check and make sure they were alive. Happily - as soon as we got close, up they would pop. 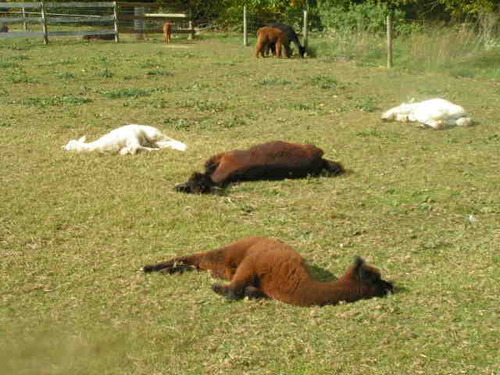 "Dead Alpacas" is the term we coined from that day on. 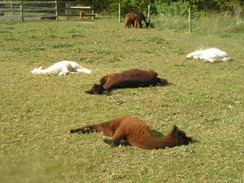 Truth be told, they are soaking up the sun - so maybe we should change it to "Lazy Alpacas" - that's probably a little more politically correct anyway. Have you ever found yourself needing to be in two places at once - and wondering how you were going to pull it off? 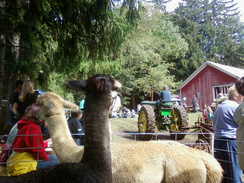 We were faced with that dilemma this past weekend when Owl Ridge Alpacas was booked to be at both the "Interlaken Historical Society County Fair and Plowing Day" in Interlaken, NY and at the "Alpaca Gala" located in PennYann, NY - on opposite sides of Seneca Lake - - and both wanting live Alpacas present! Divide and conquer was the answer - but how with only one trailer? Our friends mini-van, was the answer. 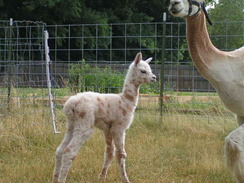 We had heard it was done before - many Alpaca breeders use them, so we thought we would give it a try. It worked - and there were stories - unfortunately the guy with the mini-van (Dan) didn't take any pictures. He did however learn a few things. 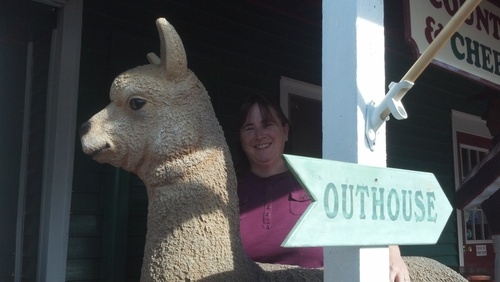 #1 - Alpacas would rather go in the side door than the back door. #2 - Make sure you close the back door if you try and put them thru the side door. #3 - If you don't ensure all the doors are closed (except the one you are trying to get them to go thru) chances are they will just walk out the other door! #4 - Alpacas can jump - a table no less. So if you take one out of the pen, blocking the exit with a table isn't going to work. 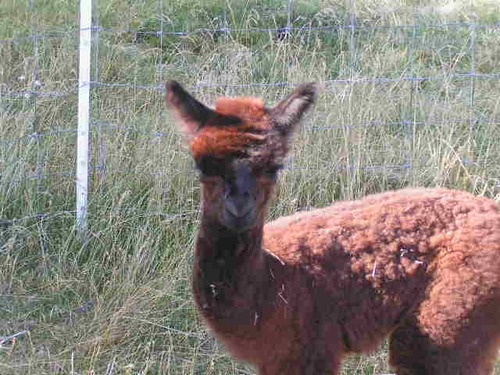 No way, it couldn't be - - yup it was, a fiberglass Alpaca. You think you've seen it all - - and then you stumble on a road-side tourist trap and what do you see? A larger than life Alpaca! It was so awesome, that I couldn't pass up the picture opportunity. And to think, we just wanted ice cream! It's with great sadness and with many tears that we pass along the loss of one of our family today. 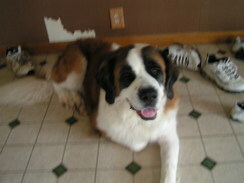 Sierra, was with us for 12 years - an extremely long life for a Saint Bernard - but one that filled our life to the fullest. In human years she was over 80. We saw the signs - slowing down, couldn't hear a dang thing, and started preparing mentally - but you never are really prepared are you. It's amazing what joys, frustration, sometimes anger that an animal can bring into your life - but somehow they fill a hole in your heart you never realized you had until they are gone. It's a shame they are only with us for what seems to be a fleeting moment in time. Sierra was there when our daughter first learned to walk, and never moved when she and her brother thought she was pillow or tried to ride her like a horse. Sierra always thought she was a lap dog, and we have many memories of her laying across the laps of friends that happened to be sitting on "her" couch. She was a great foot warmer, but a huge bed hog! Why is it that a large dog can jump on a bed and not wake you up, and then you wake up when you can't move your feet - and scoot over so they have more room? Her passing has left a huge hole in our heart, but her memories will forever warm it! Growing up in Wisconsin, it wasn't uncommon to drive by farms that had flags on their silos. Legend (if you could call it that) said this was a way to indicate that their silo was bought and paid for. 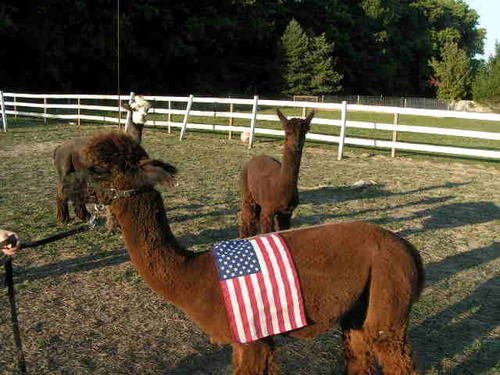 A google search indicated the same, as well as a way for farmers to show their patriotism. 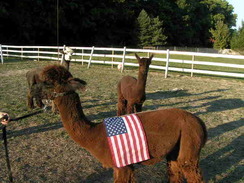 Here at Owl Ridge Alpacas we are starting a new tradition - - Alpacas with Flags! Of course it's not as permanent as painting one on a silo, but for us it has marked a milestone. We now own our entire herd outright, and that is a great feeling! Having one less monthly payment. 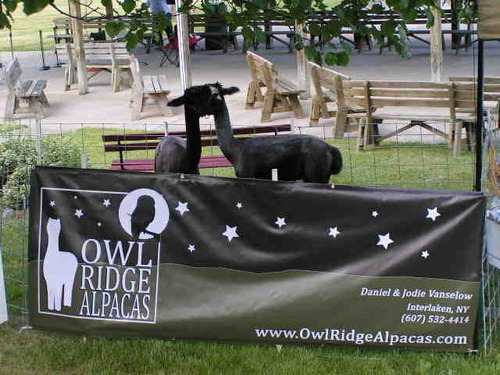 When we first got into Alpacas we were very fortunate to meet some great folks (and we continue to do so on a routine basis) who have helped us every step of the way, from the mundane repetitive questions to the creative financing that allowed us to build up our herd. That is what it's all about in this industry, helping each other be successful, and in doing that we are all successful. 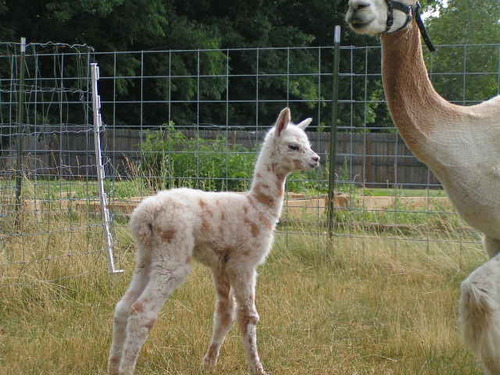 Thanks - - Jeff & Leslie Jorritsma of Autumn Mist Alpacas & Fiber Mill and John & Tacha Gennarino of Sandy Creek Alpacas for helping us get started on this great adventure and into this great lifestyle. Most importantly - - thanks to all the Military personnel and their families for the sacrifices that you all make on a daily basis. Without you, none of us could be doing what we do! Fiber - - Family - - Fun! I am a strong believer that when you need it the most, something happens in your life or someone steps into your life to help guide you in the right direction or confirm you are on the right path. 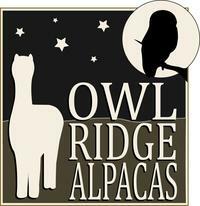 That event happened this weekend at the "Alpaca Training Academy" sponsored by Autumn Mist Alpacas, K-Ran Alpacas and Autumn Kiss Alpacas. I openly admit, I didn't want to go. It was a stressful week at work, I was tired and I was getting frustrated. I love all of my Alpacas, but it didn't feel like we were getting anywhere. Dan dragged me along (with me complaining the entire time) - we already paid the tuition, so we better go! 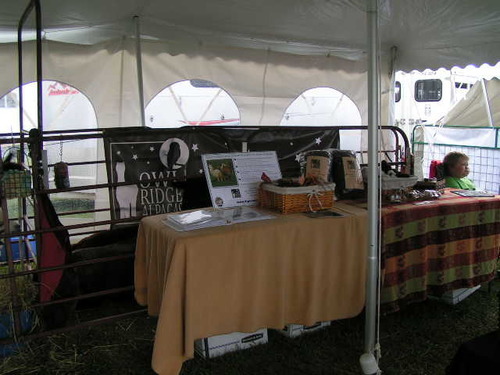 I signed up for all of the Marketing Classes, put on by Nancy Ogan of "Look At Me Now Alpacas" and farm manager for "Double "O" Good" Alpacas and Dan took all of the fiber classes taught by Cheryl Gehyl and Wini Lebrecque. Right out of the gate, Nancy got me - "It's all about attitude, maintaining a good one and being positive!" Almost felt like she was in my brain and talking directly to me - snap out of it Jodie and remember why your doing this. From that first point on, things started to change. Nancy's "Out of the Pen" marketing ideas started to get the creative juices flowing again - I couldn't wait to get home to start putting pen to paper. At the end of day two, Dan's look was priceless. My seminar ended early, so off I went to find him. I found him in a state of shock. Cheryl Gehly was evaluating our junior herdsires fleece "Storm" - and had nothing but good things to say - those standing around the table were silent as they listened to her praise and congratulations - - "This fleece is stunning!" Cheryl gave Storm's fleece character a score of EXCELLENT, there's only one score higher than that! For us, this was huge and a boost in confidence that we truly needed. We are on the right path! We ended our weekend seminar with a one-on-one session with Wini Lebrecque, who patiently answered all of our questions, helped interpret histograms and even walked around with us and helped us to evaluate some females we were interested in purchasing. To hear from Wini that I was on the right track and had a good eye - made my weekend. We went thinking we would be the first to leave on Sunday, only to be the last to go. The ride home was far different - it was filled with "OMG's did you hear was Cheryly said, and then Wini said this..." it was also filled with "we should do this, or let's do that." The Alpaca Academy happened right when we needed it most - it's renewed our energy and our passion for what we are doing and where we are going with our farm. And we finally found our tag line "Fiber * Family * Fun!" 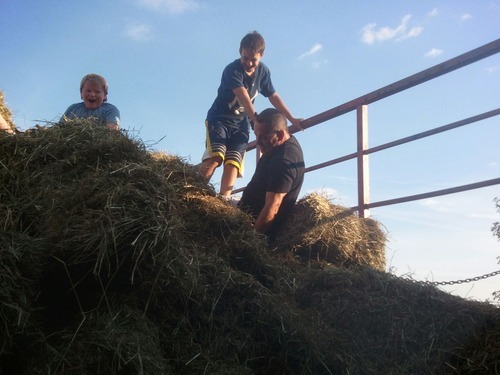 - - we breed for the Fiber, are on this great adventure with our kids, and are having a blast doing it! Freckles, some people love em, some people hate them. For me, it's a part of who I am. I've had them since I was little, and if I'm in the sun they become even more pronounced. Both of my kids have them to, and when they were little I told them they were kissed by Angels. So, when our newest addition arrived early on July 5th, and came out with spots - it was a no brainer to name her "Owl Ridge Angel Kisses" aka Freckles. 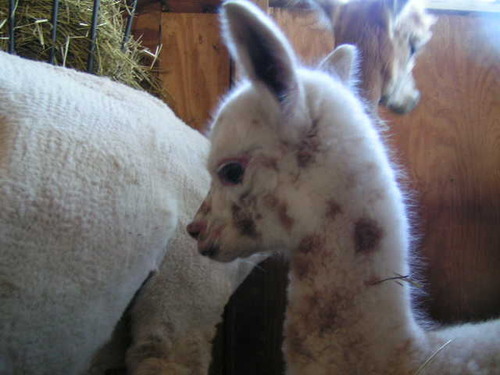 She is the cutest alpaca that I have ever laid my eyes on, and if there is any indication from her fleece, she's going to be gorgeous. Her sire is a 9 time banner winner, and her Dam is the mother of "Owl Ridge Lightening Storm" who is showing exceptional fleece characteristics as well. For now, we will continue to watch her grow and explore with her buddy "Belle." It's been a long day, time for a nap! "Hurry up and wait" I hear this all the time in the government. I think the same theme holds true with Alpacas. 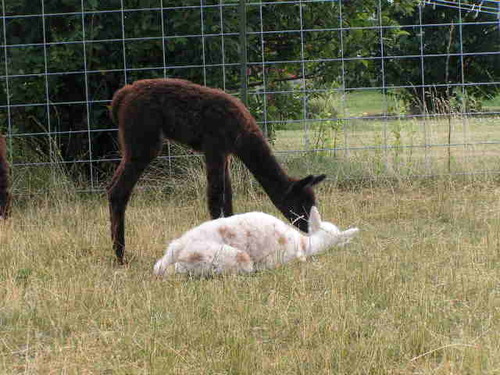 You research, plan and finally determine who you're going to breed your female Alpaca to, hurry up to get them to your sire of choice, timing for the month you desire and then you wait. And you wait. And finally as her due day grows closer you wait some more - watching for all of the signs, trying to figure out if this is the day or not. You try not to get sucked into the waiting game, but you do - its a natural thing, as we all get excited to see what we've been waiting for. Darby extended the waiting game for us this year, holding onto her little one for an additional 10 days past her due date. That may not seem like such a long wait, and could have gone on much longer - but we got sucked in. Phone calls from work to home, wanting a status update - only to be told "Nothings changed since you called 20 minutes ago." Until finally one day, when you aren't even thinking about it, you get the call you've been waiting for. Ultametly when it's time it's time, and all good things come to those who wait, and often wait somemore. It's all good - especially when you see your new addition for the first time and a few days later watch them hopping around the pasture! Owl Ridge Belle was worth the wait. A beautiful dark brown female - born June 28th! Mom and baby are doing fine. The wait never bothered either one of them. 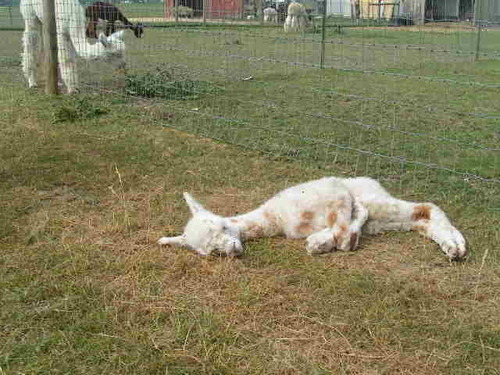 Come on Freckles, wake up! A whole passel of kids, not really helping much! 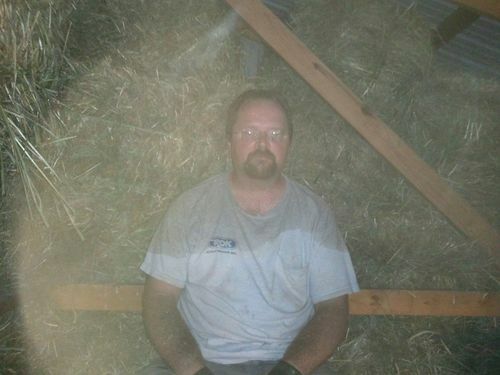 Most of the time, when hay needs to be unloaded it's the hottest day of the year. This year, the heat wasn't so bad - but the timing was awful. 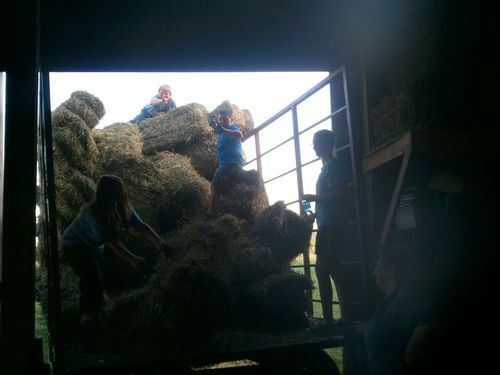 After being at the Ovid Strawberry Festival for most of the day (7:00 - 4:00pm) we arrived home to find hay wagons filled to the top, and of course the farmer needed his wagons back ASAP to get his own crop in. 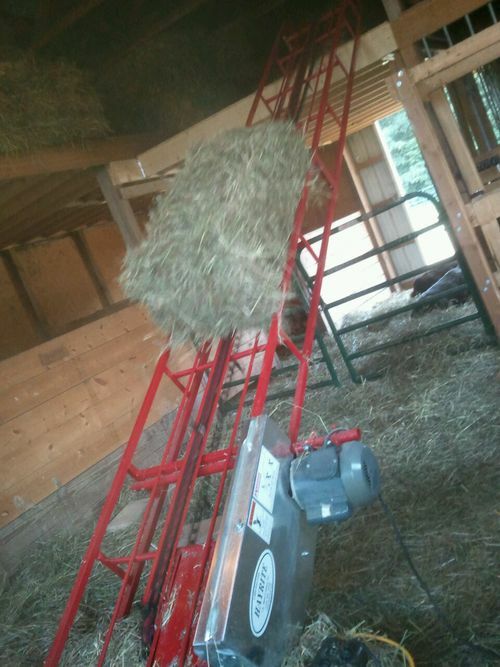 Thank goodness, we invested wisely this spring and purchased a hay elevator, if not I wouldn't be typing this blog, as we'd still be thowing hay bales - and today is the hottest day of the year so far! So, we made a few calls - recruited our kids, enlisted a few friends and their kids and off we went. 3 hours later we were done - exhausted - but all 350 bales are in the loft. By the end we were all a bit punchy (probably didn't smell so hot either) had hay in places that hay doesn't belong - but we actually had fun doing it. Spending time with our kids and friends made it go that much faster, and a cold one waiting in the fridge was icing on the cake! Swoosh & Ortiz getting ready. 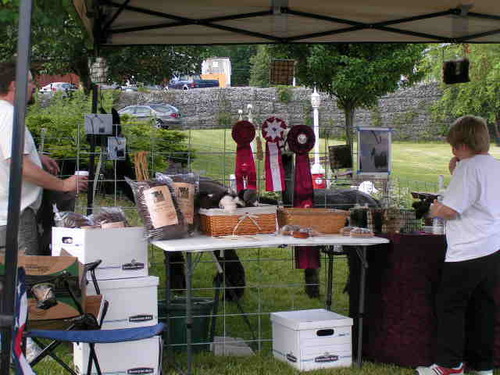 As we were setting up our display for the Ovid Strawberry Fesitval, a gentleman came up and asked...Are you that farm... and before he could finished, I jumped in and said "No - we are in Interlaken" as many people in the area confuse us with another alpaca farm not to far away. To my utter amazement (and delight) he said, "Yeah, that's the one I was thinking of - I know exactly where you are!" To a new farm (only two years old) that was music to our ears - finally someone knows who we are! We are getting somewhere! We ended up having a great conversation about a number of topics that morning. 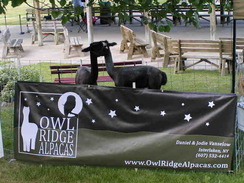 The second best part of the day was he wasn't the only one that day who knew where Owl Ridge Alpacas was, many said they recognized our animals from being in the pastures on the farm, or had driven by our place numerous times. We haven't quite made it yet (still need to sell and animal or two, three, etc) - but there's some light starting to show at the end of the tunnel, and we are establishing our farm in our community. What a great way to spend a Saturday!